Dead Silence is the gripping fourth novel in the Body Finder series. 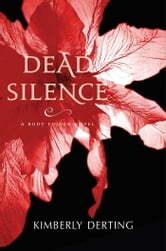 With romance, suspense, and unexpected twists, Dead Silence will keep readers guessing until the very last page. All her life Violet has grappled with her ability to sense the echoes of those who have been murdered and the matching imprint that clings to their killers. Now that she has an imprint of her own, Violet's "gift" is intolerable. Torn between her desire to lead a normal life and the pressure from the Center to continue her work tracking down killers, Violet's world starts to unravel . . . and some of her most carefully guarded secrets are exposed. Then she discovers a gruesome murder scene unlike anything she's ever encountered, and she can't rest until she's silenced the echoes for good. As Violet sets out to find a vicious murderer and his band of devoted followers, she realizes that protecting those closest to her is far more difficult than protecting herself. The entire Body Finder series is great. There's twists and turns, romance and mystery, and typical teenage drama. I would definitely recommend.